What was different with the cards? There were lots of differences on the cards. First, on the front, the images were the same but the NWF copyright was 1990 instead of 1972. The text was a smaller font too. Kinda picky stuff for the front but it is noticeable. On the back is where a lot of changes happened though. It's pretty obvious that Lipton was smart enough to realize that 18 years had transpired and that some of the facts might have changed. They checked it out and found that some of the Latin names had changed and that there may be more exacting names for the creatures than was used in 1972. So if we start at the top, the first thing you will notice is that the banner of the 1972 card has three sections, the card number; the series number and a card count of the set. The 1990 cards skipped the series number in the middle. It makes sense. They didn't know if this was the first of many or not. You just need to look at the first Brooke Bond series for a parallel. Next, the black band with the series title, is the same on both old and new. The name of the card (which was coincidentally the name of the creature) also changed in a few instances. There is a list in the next section. Here's a good question, does your computerized list of card names have the right names for each year? I have to admit that I only read three or four cards to verify that the text did not change. Might there be a card in the set with slightly different text? Yup, but it's not the same thing as when they are printing a set and notice a mistake and on the reprint, they modify the text. Eighteen years is a long time for a reprint. Even the red band that prompted you to save the cards in an album had to be updated. Why? Because the cost of the album went from .25¢ to $1, of course. 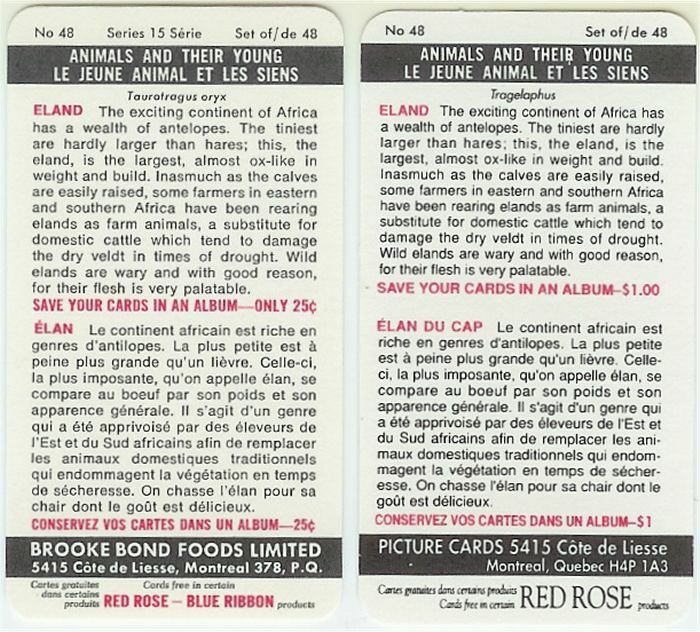 The French names are occasionally different (our display card, #48 is a good example, and the text may be slightly different, but it's not really earth shattering. The French version of the red band for saving the cards has the same difference as the English version. The bottom black band touting the company address is certainly different. Lipton couldn't exactly claim to be Brooke Bond now, could they? The street address is the same but the province ID is different. The bottom part of the card is a bit less colorful in 1990. We'll compare to the "products" version of 1972 instead of "tea/coffee". Other than color, placement; font; shape and the loss of Blue Ribbon, they are identical. Some of the card names changed? A few names did change. Four to be exact. Here's one of them for your inspection. In the first three changes, the names have more to them in the new version, sounding more precise. 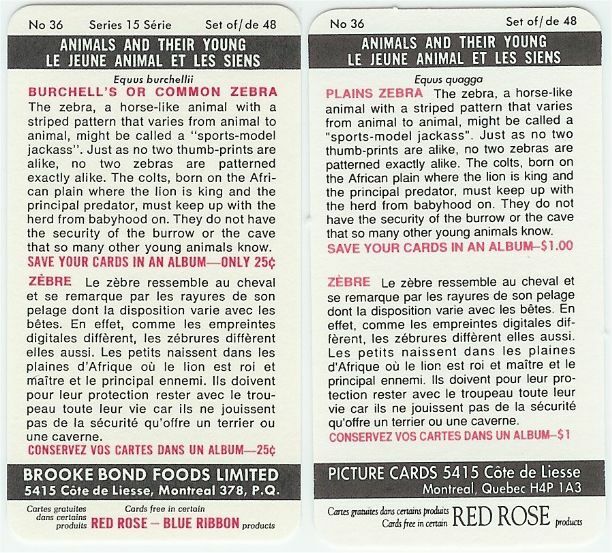 In the last card, it looks like the name Burchell's Zebra just wasn't used anymore to describe a common Plains Zebra. Take a peek and decide for yourself. So it sounds like we need another list! I'm really good at lists so here goes. So I guess we did a good job checking that out. Eighteen years is a long time and I am glad to see that they (Lipton) checked things out before they willy-nilly issued some out-of-date junk. Let's face it, they have the Red Rose reputation to uphold and that is nothing to slight.